Contains seven probiotic strains supported by clinical trials.. The formulation of Lactoxira draws on the very latest advances in neurobiology : we now know that the microorganisms that populate our digestive tract communicate with the brain (via neurotransmitter synthesis and the indirect release of cell-signalling substances) and that they influence our mood, thoughts and behaviour. This major discovery is revolutionising the way we treat those suffering from low mood, depression, and mood disorders who generally have a highly-compromised microbiome. Who is Lactoxira aimed at? those who are often moody (gloomy, irritable or sad). Lactoxira is also for anyone with a lifestyle that doesn’t support a healthy mental state (smoking, stress, excess alcohol consumption, lack of physical activity, lack of sleep, antibiotic treatment, nutritional deficiencies, particularly in vitamins D, B6, B12 and B9, ageing …). Lactoxira’s effects on mood and psychological state. What are Lactoxira’s effects on mood and psychological state? Probiotics are living microorganisms that can have a positive effect on our gut flora (1). They are associated with numerous improvements to health (relating to gastrointestinal problems (2), particularly irritable bowel syndrome (3-4), as well as to their ability to lower blood pressure (5) and reduce the risk of eczema (6)), but it seems their therapeutic potential offers even greater promise. This is one of the most striking discoveries of recent years: bacteria in the gut are able to communicate with the brain via the vagus nerve (referred to as the microbiome-gut-brain axis (8)). Even more amazingly, they can produce neurotransmitters identical to those found in the brain (9). Several strains of Lactobacilli and Bifidobacteria secrete the inhibitory neurotransmitter GABA (10), production of which is significantly reduced in people with depression and anxiety (11). Other species of bacteria produce acetylcholine (a neurotransmitter involved in memory, concentration and mood (12)) and serotonin (a tryptophan metabolite involved in regulating mood (13)). These discoveries explain why gut flora is now considered to be a virtual endocrine organ, capable of influencing the central nervous system through the microbiome-gut-brain axis (14-15). Studies have shown that the use of probiotics increases levels of certain neurotransmitters in the frontal cortex, thus reducing symptoms of depression (16). The second mechanism of action of psychobiotics is based on their ability to reduce levels of inflammation . Scientists had observed that depressed individuals had a number of abnormally high inflammatory markers (17-19), but they had not made the link with their gut flora. We now know that probiotics act against inflammation by impeding the growth of pathogenic bacteria in the small intestine, strengthening the intestinal barrier, reducing bacterial translocation and decreasing the number of inflammatory cytokines and toxins circulating in the body. Probiotics thus improve mood disorders as a result of their multiple effects against inflammation (2-23). These psychological benefits have indeed been confirmed by two randomised, controlled clinical trials (24-25). Are probiotics effective at treating depression? What is Lactoxira comprised of? Bifidobacterius longum (present in the human gastrointestinal tract, it reduces symptoms of depression). Lactobacillus plantarum (present in certain fermented, cabbage-based foods, it offers neuroprotection and combats inflammatory processes). Lactobacillus casei (present in the gut and oral mucous membranes, it increases concentrations of tryptophan, serotonin, and dopamine, producing a significant improvement in mood in those with depression). Lactobacillus acidophilus (an anxiolytic, it populates the gastrointestinal tract and oral mucous membranes). 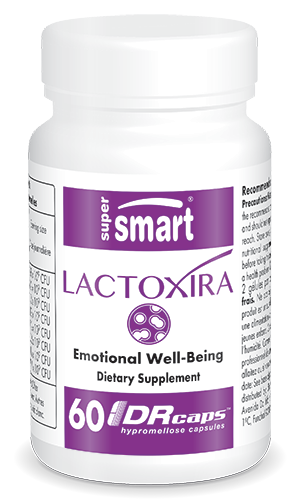 Lactobacillus brevis (reduces symptoms of anxiety). Lactobacillus salivarius (the most active of all). Some of these strains are able to withstand stomach acids (if they weren’t, there would be no benefit to eating yogurts or drinking kefir), but to maximise their chances of survival and ensure the formulation is as effective as possible, the delivery method chosen by SuperSmart is gastro-resistant capsules which release the probiotics at the site where they need to act – the gut. The number of living microorganisms that arrive there intact determines their impact. This is also why each dose of Lactoxira contains more than 100 billion bacteria (CFU). 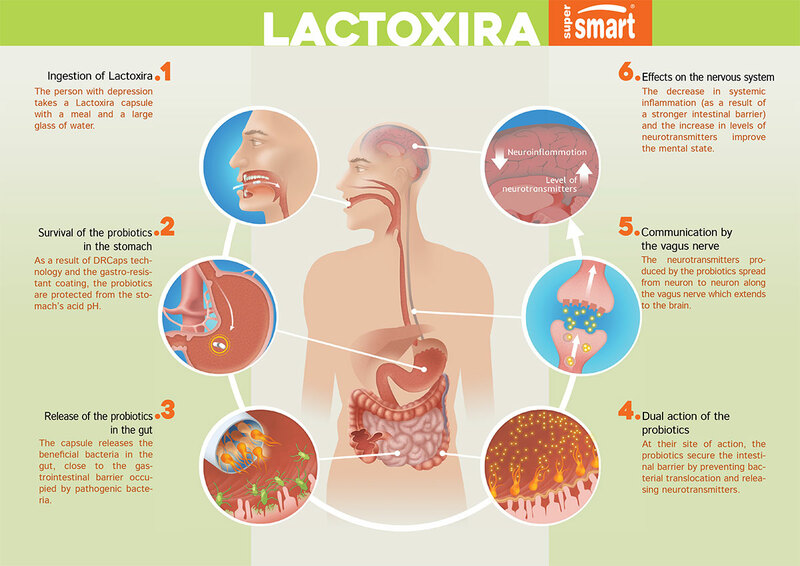 To enhance its efficacy still further, an optimum proportion of prebiotics (or fructo-oligosaccharides) has been added to the Lactoxira formulation. These natural compounds, which are indigestible by humans, support the growth of probiotics and make it easier for them to colonise the digestive system. According to the WHO, depression is a leading factor in morbidity and disability worldwide: the number of victims has been growing steadily for decades. Medication is not very effective at treating chronic depression (results are acceptable in only 30% of cases (27)), the rate of relapse is very high (around 50%) and there are numerous side-effects. Microorganisms in the gut are able to produce neurotransmitters that are identical to those synthesised in the brain. They are sent to the brain via the vagus nerve. .
Modern lifestyles have led to a dramatic fall in numbers of beneficial microorganisms, which probably explains the sharp increase in auto-immune diseases and depression. How did scientists identify this new property? It had been suspected for decades that microbiota played an important role in determining mood (as far back as 1863, Ludwig Andreas Feuerback was asserting that ‘we are what we eat’), but it had not been proven scientifically. In studies conducted on laboratory animals, scientists first succeeded in modifying the behaviour of selected species by adding probiotics to their food: they observed that certain types of probiotic made the animals more aggressive while others had soothing effects. These early findings encouraged researchers to test their theories in humans suffering from anxiety, depression or the effects of chronic stress – with convincing results. Thus after several clinical trials, it was possible to isolate all the strains shown to be most active in this area, so that they could be combined in a cutting-edge probiotic formulation. How can you make Lactoxira even more effective? If you want to maximise the effects of Lactoxira, here are some measures to adopt alongside your supplementation. 1) Improve your diet throughout the supplementation period (28). The main thing is to gradually increase your intake of dietary fibre: the higher it is, the lower the risk of depression (29). Dietary fibre is only digestible by beneficial bacteria: consuming more of it therefore gives them an advantage over pathogenic organisms. It’s found in almost all fresh fruits and vegetables as well as in whole grains. In addition, a number of studies have demonstrated an inversely-proportional link between consumption of foods rich in omega-3 fatty acids and depression (30). Some scientists thus advise those with depression to increase their weekly consumption of oily fish or to take omega-3 fatty acid supplements (1-4g a day of EPA/DHA) (31-32). Finally, it’s important to increase your intake of B group vitamins (especially folic acid). Vitamin B deficiency is common in those with depression (33-35). These nutrients play an important role in the synthesis of neurotransmitters which influence mood (particularly serotonin and dopamine). 2) Adopt a healthier lifestyle during the supplementation period. Take the opportunity to go to bed earlier to improve the quality of your sleep. It’s also a good moment to undertake new projects, reach out to loved ones and acknowledge your fears. 3) Discover the benefits of massage. Several studies (36-37) have shown that massage helps improve mood and sleep by releasing additional serotonin and dopamine. 4) Significantly increase your level of physical activity. Being active is vital for mental well-being. The metabolic changes it induces enhance brain function, and particularly mood (38-39). To feel the benefits, you need to be physically active for around 30 minutes a day, five days a week. If you’re already managing to do this, you could increase the intensity or duration of your activities. Lactoxira can also be combined with other dietary supplements such as SAM-e, a natural molecule that plays a key role in metabolising neurotransmitters, or St. John’s Wort, as long you use it in a well-controlled manner (it’s a plant that interacts with many drugs and substances). Drawing on the very latest scientific research, Lactoxira provides the means to do what would have previously been unthinkable: improve an individual’s psychological state by improving their microbiota composition and optimising their gut-brain communication.